SHANDELEE, NY (August 18, 2015) – For the third concert in its 2015 series, the Shandelee Music Festival welcomes, Adrienn Kantor, flute and Erika Allen, piano, for “An Evening of Chamber Music” on Thursday, August 20, 2015. Adrienn Kantor, an internationally acclaimed and prize-winning flautist, has performed in 11 countries over the past five years. She has toured with prestigious orchestras and performed at Alice Tully Hall, NYC, Shanghai Grand Theater, National Center for the Performing Arts in Beijing, Mariinsky Theater in St. Petersburg, Great Hall of Moscow Conservatory, Konzerthaus Vienna, and Konzerthaus Berlin. Ms. Kantor appeared at Carnegie Hall at the age of 19, and was praised by Eugene Chan of examiner.com for "her graceful adornment in the slow movement of the Brahms Double Concerto.” As a soloist, she recently performed Carl Reinecke’s Flute Concerto with the American Symphony Orchestra, where Kevin T. McEneaney of The Millbrook Independent said she "excelled in nuance, tone, and poetic edge." Ms Kantor is a prize winner of the New York Flute Club’s Competition and the Bard Conservatory’s Concerto Competition. After winning two competitions at the Royal Conservatoire of Scotland, she was invited to play two flute concertos in 2015 with the RCS orchestra in Glasgow. Currently pursuing her Master of Music degree at the Royal Conservatoire of Scotland, Ms. Kantor is participating in the BBC Scottish Symphony Orchestra’s mentoring scheme. She holds a Bachelor of Music in Flute Performance from the Bard Conservatory and a Bachelor of Arts in German Studies from Bard College. Erika Allen began her musical studies at age 7. 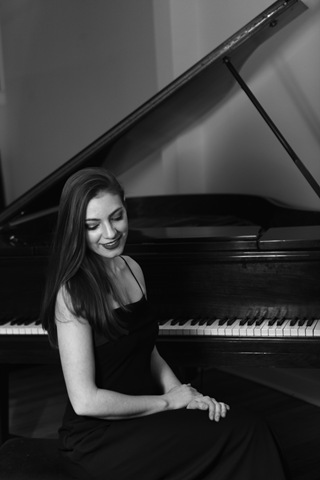 She received her Master’s Degree in collaborative piano from Juilliard, and while there, she was awarded the Irene Diamond Graduate Fellowship, James Friskin Scholarship, and Howard & Ethel B. Ross Piano Scholarship. Ms. Allen’s Bachelor’s Degree is from Oberlin Conservatory where she soloed in 2006 with one of Oberlin’s chamber orchestras after winning the school’s Mozart Piano Concerto Competition. In the spring of 2008, she completed a Master’s Degree at the New England Conservatory. Ms. Allen has served as a staff pianist for Sejong International Music Festival at the Curtis Institute, Bowdoin Music Festival, Juilliard, New England Conservatory, and Boston Conservatory. In past summers, she has attended Kneisel Hall Chamber Music Festival, Banff, Eastern Music Festival, and Bowdoin International Music Festival. She is currently on the faculty at Bard College in New York. The program for “An Evening of Chamber Music” with Adrienn Kantor and Erika Allen will feature Pour invoquer Pan by Claude Debussy, Fantasie by Phillippe Gaubert, Sonata by Poulenc, Introduction and Rondo Capriccioso by Camille Saint-Saens, and Sonata for Flute and Piano by Sergei Prokofiev. All performances in the Sunset Concert Series begin at 8 p.m., and each concert will be followed by a specialty dessert reception. The Shandelee Music Festival Sunset Concert Pavilion is located at 442 J. Young Road, Livingston Manor. Concert tickets are $30 for adults, $25.00 for Shandelee Music Festival members and $10.00 for students 17 and under. Advanced concert reservations are required by calling 845-439-3277. Online reservations can be made at http://www.shandelee.org/concerts/tickets.htm. About the Shandelee Music Festival: Founded in 1993, the Shandelee Music Festival is the manifestation of a love for the arts and the recognition of the human spirit. A private, not-for-profit organization, the Shandelee Music Festival’s philosophies and goals provide for the further development and nurturing of an individual’s creativity and passion for music while enriching the cultural community of Sullivan County.